"Rheia" redirects here. For the 2016 album by Oathbreaker, see Rheia (album). Rhea (/ˈriːə/; Ancient Greek: Ῥέα [r̥é.aː]) is a character in Greek mythology, the Titaness daughter of the earth goddess Gaia and the sky god Uranus as well as sister and wife to Cronus. In early traditions, she is known as "the mother of gods" and therefore is strongly associated with Gaia and Cybele, who have similar functions. The classical Greeks saw her as the mother of the Olympian gods and goddesses, but not as an Olympian goddess in her own right. The Romans identified her with Magna Mater (their form of Cybele), and the Goddess Ops. Most ancient etymologists derived Rhea (Ῥέα) by metathesis from ἔρα "ground", although a tradition embodied in Plato and in Chrysippus connected the word with ῥέω (rheo), "flow", "discharge", which is what LSJ supports. Alternatively, the name Rhea may be connected with words for the pomegranate, ῥόα, later ῥοιά. The name Rhea may ultimately derive from a pre-Greek or Minoan source. Graves suggested that Rhea's name is probably a variant of Era, 'earth'. 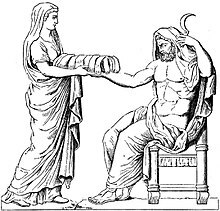 According to Hesiod, Cronus sired six children by Rhea: Hestia, Demeter, Hera, Hades, Poseidon, and Zeus in that order. The philosopher Plato recounts that Rhea, Cronus and Phorcys were the eldest children of Oceanus and Tethys. Gaia and Uranus told Cronus that just as he had overthrown his own father, he was destined to be overcome by his own child; so as each of his children was born, Cronus swallowed them. Rhea, Uranus and Gaia devised a plan to save the last of them, Zeus. Rhea gave birth to Zeus in a cavern on the island of Crete, and gave Cronus a stone wrapped in swaddling clothes, which he promptly swallowed; Rhea hid her infant son Zeus in a cave on Mount Ida. Her attendants, the warrior-like Kouretes and Dactyls, acted as a bodyguard for the infant Zeus, helping to conceal his whereabouts from his father. In some accounts, by the will of Rhea a golden dog guarded a goat which offered her udder and gave nourishment to the infant Zeus. Later on, Zeus changed the goat into an immortal among the stars while the golden dog that guarded the sacred spot in Crete was stolen by Pandareus. Rhea had "no strong local cult or identifiable activity under her control". She was originally worshiped on the island of Crete, identified in mythology as the site of Zeus's infancy and upbringing. Her cults employed rhythmic, raucous chants and dances, accompanied by the tympanon (a wide, handheld drum), to provoke a religious ecstasy. Her priests impersonated her mythical attendants, the Curetes and Dactyls, with a clashing of bronze shields and cymbals. The tympanon's use in Rhea's rites may have been the source for its use in Cybele's – in historical times, the resemblances between the two goddesses were so marked that some Greeks regarded Cybele as their own Rhea, who had deserted her original home on Mount Ida in Crete and fled to Mount Ida in the wilds of Phrygia to escape Cronus. A reverse view was expressed by Virgil, and it is probably true that cultural contacts with the mainland brought Cybele to Crete, where she was transformed into Rhea or identified with an existing local goddess and her rites. "A temple of no great size [at Olympia] in the Doric style they have called down to the present day Metroion (Temple of the Mother), keeping its ancient name. No image lies in it of the Meter Theon (Mother of the Gods), but there stand in it statues of Roman emperors." "Well worth seeing here [at Akriai, Lakedaimon] are a temple and marble image of the Meter Theon (Mother of the Gods). The people of Akriai say that this is the oldest sanctuary of this goddess in the Peloponessos." "Mount Thaumasios (Wonderful) lies beyond the river Maloitas [in Arkadia], and the Methydrians hold that when Rhea was pregnant with Zeus, she came to this mountain and enlisted as her allies, in case Kronos should attack her, Hopladamos and his few Gigantes. They allow that she gave birth to her son on some part of Mount Lykaios, but they claim that here Kronos was deceived, and here took place the substitution of a stone for the child that is spoken of in the Greek legend. On the summit of the mountain is Rhea's Cave, into which no human beings may enter save only the women who are sacred to the goddess." "The Titanes had their dwelling in the land about Knosos [in Krete], at the place where even to this day men point out foundations of a house of Rhea and a cypress grove which has been consecrated to her from ancient times." "In Crete there is said to be a sacred cave full of bees. In it, as storytellers say, Rhea gave birth to Zeus; it is a sacred place and no one is to go near it, whether god or mortal. At the appointed time each year a great blaze is seen to come out of the cave. Their story goes on to say that this happens whenever the blood from the birth of Zeus begins to boil up. The sacred bees that were the nurses of Zeus occupy this cave." Rhea only appears in Greek art from the fourth century BC, when her iconography draws on that of Cybele; the two therefore, often are indistinguishable; both can be shown on a throne flanked by lions, riding a lion, or on a chariot drawn by two lions. In Roman religion, her counterpart Cybele was Magna Mater deorum Idaea, who was brought to Rome and was identified in Roman mythology as an ancestral Trojan deity. On a functional level, Rhea was thought equivalent to Roman Ops or Opis. In Homer, Rhea is the mother of the gods, although not a universal mother like Cybele, the Phrygian Great Mother, with whom she was later identified. In the Argonautica by Apollonius of Rhodes, the fusion of Rhea and Phrygian Cybele is completed. "Upon the Mother depend the winds, the ocean, the whole earth beneath the snowy seat of Olympus; whenever she leaves the mountains and climbs to the great vault of heaven, Zeus himself, the son of Cronus, makes way, and all the other immortal gods likewise make way for the dread goddess," the seer Mopsus tells Jason in Argonautica; Jason climbed to the sanctuary high on Mount Dindymon to offer sacrifice and libations to placate the goddess, so that the Argonauts might continue on their way. For her temenos they wrought an image of the goddess, a xoanon, from a vine-stump. There "they called upon the mother of Dindymon, mistress of all, the dweller in Phrygia, and with her Titias and Kyllenos who alone of the many Cretan Daktyls of Ida are called 'guiders of destiny' and 'those who sit beside the Idaean Mother'." They leapt and danced in their armour: "For this reason the Phrygians still worship Rhea with tambourines and drums". The name of the bird species Rhea is derived from the goddess name Rhea. Rhea, the second largest moon of the planet Saturn is named after her. ^ N. Hopkinson. "Rhea in Callimachus' Hymn to Zeus". The Journal of Hellenic Studies. 104 (1984:176–177; the evidence was marshalled by O. Gruppe, Griechische Mythologie und Religionsgeschichte, Munich, 1906, vol. II: 1524, col. II. ^ "Rhea – Greek goddess". Encyclopædia Britannica. ^ Nilsson, Martin Persson (1 January 1950). The Minoan-Mycenaean Religion and Its Survival in Greek Religion. Biblo & Tannen Publishers. ISBN 9780819602732 – via Google Books. ^ Sidwell, R. T. (1981). "Rhea was a broad: Pre-Hellenic Greek myths for post-Hellenic children". Children's Literature in Education. 12 (4): 171–176. doi:10.1007/BF01142761. ^ Hesiod. Theogony, 453 ff. ^ a b Roller, Lynn E., In Search of God the Mother: The Cult of Anatolian Cybele, University of California Press, 1999. p. 171. ^ Roller, Lynn E., In Search of God the Mother: The Cult of Anatolian Cybele, University of California Press, 1999. p. 171. See also Strabo. Geography, 469, 12. ^ (Apollonius of Rhodes), Richard Hunter, tr., 1993. Jason and the Golden Fleece (Oxford: Clarendon Press), Book II, p. 29f. Homer, The Odyssey with an English Translation by A.T. Murray, PH.D. in two volumes. Cambridge, MA., Harvard University Press; London, William Heinemann, Ltd. 1919. Online version at the Perseus Digital Library. Hesiod, The Homeric Hymns and Homerica with an English Translation by Hugh G. Evelyn-White, Cambridge, MA.,Harvard University Press; London, William Heinemann Ltd. 1914. Online version at the Perseus Digital Library. Anonymous, The Homeric Hymns and Homerica with an English Translation by Hugh G. Evelyn-White. Homeric Hymns. Cambridge, MA.,Harvard University Press; London, William Heinemann Ltd. 1914. Online version at the Perseus Digital Library. Callimachus. Hymns, translated by Alexander William Mair (1875–1928). London: William Heinemann; New York: G.P. Putnam's Sons. 1921. Online version at the Topos Text Project. Diodorus Siculus, Diodorus Siculus: The Library of History. Translated by Charles Henry Oldfather. Twelve volumes. Loeb Classical Library. Cambridge, Massachusetts: Harvard University Press; London: William Heinemann, Ltd. 1989.Online version at the Lacus Curtius: Into the Roman World. Apollonius Rhodius, Argonautica translated by Robert Cooper Seaton (1853–1915), R. C. Loeb Classical Library Volume 001. London, William Heinemann Ltd, 1912. Online version at the Topos Text Project. Vergil, Aeneid. Theodore C. Williams. trans. Boston. Houghton Mifflin Co. 1910. Online version at the Perseus Digital Library. Ovid, Metamorphoses translated by Brookes More (1859–1942). Boston, Cornhill Publishing Co. 1922. Online version at the Topos Text Project. Antoninus Liberalis, The Metamorphoses of Antoninus Liberalis translated by Francis Celoria (Routledge 1992). Online version at the Topos Text Project. Nonnus, Dionysiaca translated by William Henry Denham Rouse (1863–1950), from the Loeb Classical Library, Cambridge, MA, Harvard University Press, 1940. Online version at the Topos Text Project. Wikimedia Commons has media related to Rhea (mythology).